Nothing is worse than a badly cooked egg—overcooked, rubbery, bland. But when cooked superbly, it is perfection. Eggs are on my list of things I can never tire of eating. Scrambled, poached, baked, boiled, fried (and deep-fried)—I love them all. Pair them with another favourite food of mine, avocados, and they become a new favourite breakfast entrée. Avocado is actually wonderful warm, and takes on a very similar flavour profile as a boiled egg. The egg yolk is creamy and still a little runny at the very centre. 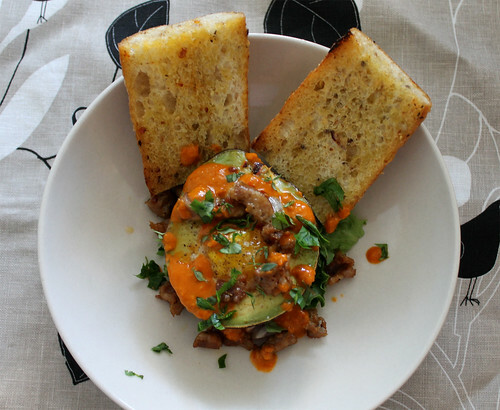 Dig in with a spoon, being sure to get a little bit of everything—avocado, egg, sausage, hot sauce—and spread it all over a slice of fried bread. Absolutely delicious! Cut the avocado in half lengthwise and remove the pit. Squeeze 1/2 lemon over both avocado halves; roll the lemon juice over the surface of the avocado and remove any excess. Carefully crack an egg and separate the egg white into a small bowl. 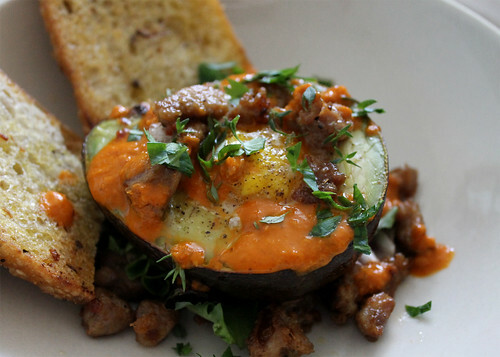 Place the egg yolk into the hole of an avocado half. Carefully pour in egg white until the rest of the hole is filled (you won’t be able to use all of the egg white). Season with salt and pepper. Repeat with the remaining egg and avocado half. Carefully place avocado halves onto a small baking sheet or baking dish. Bake for about 15 to 20 minutes, or until egg whites are just set. While the eggs are baking, heat a large heavy skillet over medium heat. Add the chorizo sausage and fry until brown and crispy, about 6 to 8 minutes. As the sausage is browning, push the meat to one side of the pan. Drizzle or brush the bread slices with a little olive oil and add to the pan. Fry until golden brown on both sides. Remove from heat and set aside. Remove the eggs from the oven when ready. Place one small handful of salad greens on each plate. Place an avocado half on each plate, along with two slices of fried bread. Spoon half of the sausage mixture over each avocado half. Sprinkle with fresh parsley, a little bit of lemon juice, olive oil, and hot sauce, if using. Serve immediately.